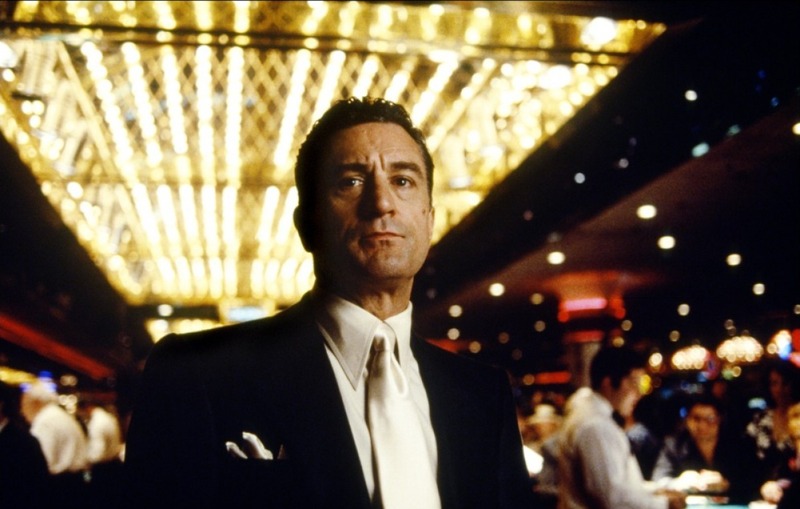 Inspired by true events and real-life characters, Casino celebrates Vegas before it was scrubbed clean and gentrified. Martin Scorsese delivers another intense, if not perfect, journey into the intriguing and violent world of Crime Inc. 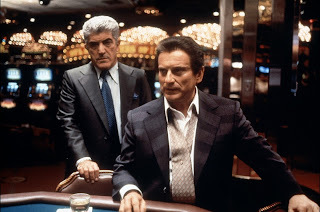 Expert handicapper Sam "Ace" Rothstein (Robert De Niro) always possessed a talent for making money from gambling. In the early 1970s his mid-west Mafia associates, backed by the Teamsters, reward him by giving him his own Las Vegas casino, Tangiers, to run. Ace operates a tight joint, weeding out the lower class criminals, disposing of cheats, and maximizing profits, becoming a well-respected man about town, in as far as Vegas respects any man. Nicky Santoro (Joe Pesci) was Ace's extremely violent sidekick on their way up in the shadow of the criminal world, and Ace is not thrilled when Nicky also relocates to Vegas. Ace meets and marries professional hustler Ginger McKenna (Sharon Stone), a gorgeous but money-hungry gold digger with an unhealthy attachment to small time hustler Lester Diamond (James Woods). Eventually Ace's life begins to unravel: he insults the wrong local power brokers and runs afoul of Vegas' licensing requirements; Nicky's violent methods reflect badly on Ace's business; and Ginger looks to rob him blind and make off with their daughter. Further developing the visual style of GoodFellas, Scorsese directs the front end of Casino with plenty of colour, movement, and panache, the intermittent narration by De Niro and especially Pesci adding sharp humour and plenty of personality. Scorsese recognizes in the sights, sounds, underlying sleaze and unbridled greed of Vegas the perfect playground for criminals looking for a veneer of respectability as they rake in the easy profits. The last third of Casino slows down to a lumbering pace, the disintegrating relationship between Ace and Ginger sucking the life out of the movie. The crime and casino elements take a back seat to the interminable melodrama of Ginger betraying Ace at every opportunity, his refusal to decisively kick her out of his life a blot against his otherwise sharp judgement. Robert De Niro and Joe Pesci play against each other with ease born from intense professional familiarity. After Raging Bull and GoodFellas, Casino represents their third collaboration with Scorsese, and once again the characters of Ace and Nicky share a destructively dependent relationship. They need each other yet manage to also repeatedly trade biting insults and hurtful betrayals. Casino lives off the energy of De Niro and Pesci, the former eager to transition from a life of crime to the appearance of respectability, the latter more interested in maximizing profit in a city that rewards abject criminality. Ginger probably represents the pinnacle of Sharon Stone's acting career, and she deserves credit for holding her own opposite De Niro and Pesci. Ginger embodies the single weak spot that Ace has, and Stone grabs the role with relish, earning herself a nomination for a Best Supporting Actress Academy Award. Ginger's obsession with materialistic wealth and ability to manipulate men perfectly fits Stone's screen persona, with the added spice of Ginger having a blind spot of her own in the shape of Lester Diamond. The relationship between Ginger and Diamond adds undeniable tension to Casino, but it's non-development also represents a lost opportunity. At nearly three hours, Casino does overreach the scope of the available material. But the better moments leave a lasting impression, and while the movie does not deal a royal flush, it delivers a full house.